Toronto boasts one of the highest costs of living in Canada. Whether you’re buying groceries, joining a recreational sports team or spending the night in a hotel, it’s generally true that you will pay more in the country’s largest city. Nowhere is the high cost of Toronto more acutely felt than in the housing market, where the average home now costs about $1M. For many people, the very idea of homeownership in Toronto is incomprehensible, and for those who do own, the expenses don’t stop at the mortgage. It costs more to insure a home in Toronto than any other city in Ontario. We recently examined the factors that determine the rates of a home insurance policy. Now here’s how those same factors conspire to inflate Toronto insurance costs. Since most new developments in the crowded city of Toronto are high-rises and condos, the average house is a little long in the tooth. Many homes in the city predate the 20th century and come with dated heating sources, plumbing and wiring. Of course, not all older homes are in a state of disrepair; many have received upgrades and function nearly good as new. If you’re looking for a home in Toronto, just be aware that certain elements that impact your insurance premiums may be outdated. If you manage to find a newer home it’s still worth looking into critical elements, like wiring, heating and plumbing. Some places are small enough to be categorized as a single entity, but Toronto is not one of those places. Its swathe of diverse communities leads to different insurance costs in different areas, based on the varying probability of a claim. If your neighbourhood has a high number of break-ins each year, you’ll likely have to pay more in home insurance premiums than if you live on a quiet residential street. In general, though, no Toronto location is a plus when it comes to insurance costs, because even the safest locations don’t compete with sleepy small town alternatives. Many Toronto homes feature older plumbing or heating sources. 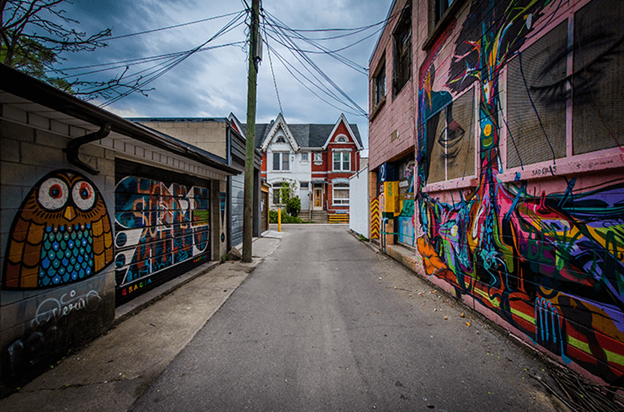 Many Toronto homes are exposed to a greater break-in or vandalism risk than small town homes. But these are generalizations that may not necessarily relate to every house in the city. When we really get to the crux of the matter is when we consider what a home costs to repair. Insurance coverage is meant to repair and replace the damages and losses suffered by the policyholder, and in Toronto, those costs tend to be higher. The labour involved in fixing Toronto homes is usually higher than elsewhere for a number of reasons. Because homes tend to be older they are more vulnerable to damage. And because Toronto homes tend to be packed tightly together they can be difficult to work on, leading to a greater number of labour hours. Likewise, lawns in Toronto are often small and workers may need to operate directly from the road, which can add to the time and difficulty of the labour. If you think the expenses of owning a home in Toronto end with the mortgage, you’re sadly mistaken. As is the case with most things in the Big Smoke, you’ll be paying more to ensure that expensive home. Keep that in mind when determining the cost of homeownership. If you aren’t prepared to shoulder the full cost, you may find yourself struggling to keep afloat.